A cost-effective and lightweight 2mm cardboard, suitable for semi-permanent displays where minimum weight and thickness is required. Available in 1.5mm & 2mm thick. Available in 5mm, this product is lightweight and cost-effective – ideal for inexpensive and simple display purposes. Available in black or white finish. A premium, lightweight and robust board available in 10mm and 20mm. Both thicknesses can be finished with a black or white melamine edging. Available in 2mm and 5mm thickness, this product is a flexible waterproof substrate which can be glued, screwed and nailed. Suitable for both indoor and outdoor use. Available in 3mm and 6mm, this is a clear plastic that resembles glass but is many times stronger and much lighter. With polished edges, this material gives a superior result. Facemounted prints are placed on the back and viewed through the acrylic. Acrylic can also be drilled allowing placement of stand-off bolts for wall mounting. A high-strength, double-sided adhesive ready to mount onto your own choice of backing. A full cover film is added to the back of your print, with a second adhesive being covered by a release paper which is simply removed when the print is ready for mounting. Most suitable for protection of prints that will be mounted. Pressure-sensitive laminate is applied to the front of the print only. Ideal for inkjet prints and other images that may be heat sensitive. Available in Gloss, Satin, Santex (ideal for pull up banners). Ideal for protection of prints that will not be mounted. Suitable for photographic prints, posters, newspaper and laser prints. 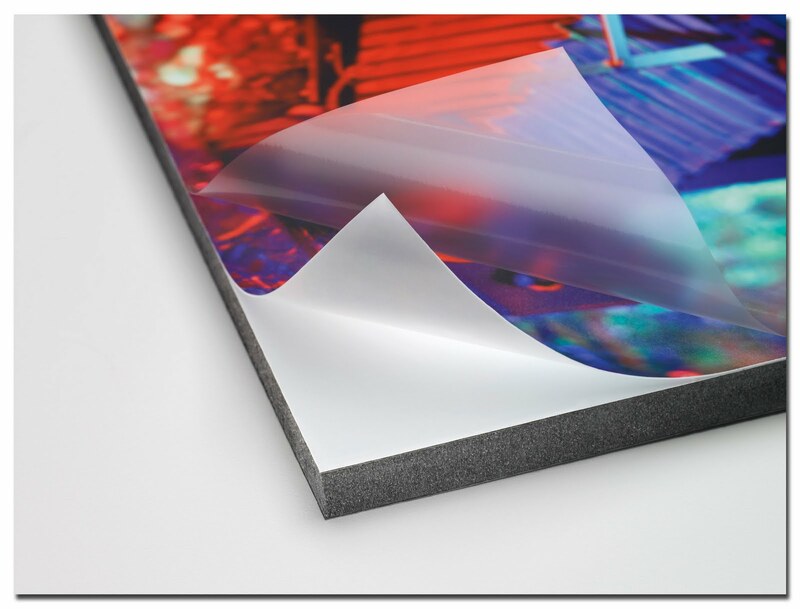 Prints are encapsulated in laminate, offering protection from moisture, physical damage, dirt, harmful gases and UV light. Available in Gloss and Matt.